Step 1 Bring a large pot of well-salted water to a boil. Set up a bowl of well-salted ice water. Cook the broccoli rabe in the boiling water for 1 to 2 minutes and then immediately plunge in the salted ice water. This will prevent the broccoli rabe from being overcooked and will set the lovely green color. Step 2 Drain the broccoli rabe and squeeze out any excess water; coarsely chop. Place the broccoli rabe in the bowl of a food processor and puree until it is a coarse paste. Add the pistachios and parmigiano and puree until smooth. Taste and adjust the seasoning; you probably will need more salt. Add the ricotta and pulse until combined. Taste for seasoning once again-it should be full-flavored, slightly bitter and creamy at the same time. Set aside. Step 3 Bring a large pot of well-salted water to a boil. (If you are making the pasta right after the pesto, just use the broccoli rabe blanching water.) Cook the pasta 1 minute less than the cooking time on the package. Step 4 While the pasta is cooking, place the pesto in a large skillet and add about 1 to 1 1/2 cups of the pasta cooking water; place over medium-high heat. 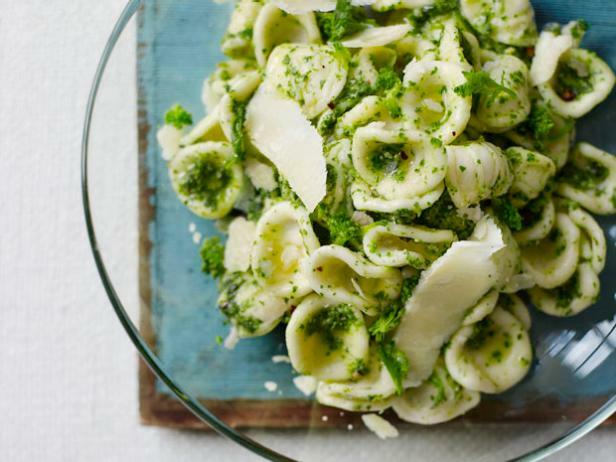 When the pasta is ready, drain and add to the skillet with the pesto. Stir vigorously to combine and cook until the sauce is creamy and heated through, 1 to 2 minutes; add salt to taste. Remove from the heat, add 1 to 2 tablespoons olive oil, if desired, and stir vigorously. Garnish with more parmigiano. Voila!